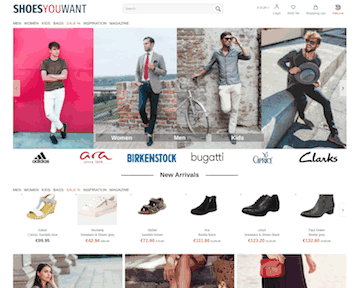 shoesyouwant Partnerprogramm bei ADCELL - Hier anmelden! At Shoesyouwant.com, you will find over 100,000 different shoes to choose from. Be it women’s, men’s or children’s shoes, we have a variety of brands and price range available for you. Our unique SALE range has more than 1600 models, which are available at a discounted rate of as low as 50%. Besides you get some amazing services, like ordering the product over the phone or buy on instalment. Also with every purchase, you can indirectly lend support to small local dealers. Shoesyouwant.com is the ultimate stop for the women who love to own a great collection of shoes, as it displays a huge assortment irrespective of the sizes. Stylize your beautiful dress with the perfect pair of designer shoes to achieve a complete overall look. Whether you are looking for women’s sneakers, pumps, high heels, sandals, ankle boots or slippers, you can all find it right here with a huge range of selections of around 50,000 shoes. You can also avail attractive discounts and free shipping charges on this platform. At Shoesyouwant.com you will discover a huge variety of modern and chic men’s shoes, available in all sizes and colours. Also funky sneakers, black oxford shoes or comfortable sandals for summer are perfect for macho style. The most famous men’s shoe brands this season are Bugatti, Llyod, Sioux, Camel Active, Nike, Adidas and Ecco. For some adventure trekking, brands like Meindl and Lowa are especially popular as men’s hiking boots. Also get some attractive offers in the SALE range of men’s shoes where the prices get reduced to up to 50%. Ich akzeptiere die Programmbedingungen und möchte mich beim shoesyouwant Programm anmelden.